Explore an engineered biological system through a computer simulation, an electronics building kit, and a real-life example. If you have not had a lesson on how the bacterial photography system works, go read the first half of the design assignment page. In this activity, we'll explore signaling in the context of an electrical circuit. As you work through this exercise, consider how the lessons learned from experimenting with an electronic circuit would map to the engineering of biological systems. You will be given a kit to construct this circuit. 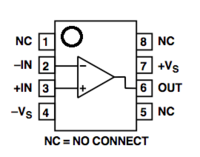 In this exercise, you'll be working with circuits connected to a battery. Although you are unlikely to seriously injure yourself, you should make a habit of unplugging / powering-off the circuit before you touch it. Never directly connect the two battery terminals (+/power and -/ground) with only wire. This is called a "short circuit" and can damage or drain your battery. The OpAmp has one pin for + power and one pin for ground. The diodes (photodiode and LED) must have their positive legs toward power and their negative legs toward ground. Notice that the diodes are round except for one flat side, which indicates the negative leg (flat line looks like a minus sign). Make sure not to connect your battery backwards. Use red for power and black/blue for ground. Wires and resistors don't care which direction they are plugged in. Photodiode: a light sensor. When light shines on the photodiode, its resistance decreases, and current flows through it. The photodiode is analogous to the Cph8-OmpR signaling system in the living bacterial photography system. OpAmp: a signal propagator. More generally, an OpAmp is a logic device that detects and amplifies a difference between the currents into its plus and minus inputs. 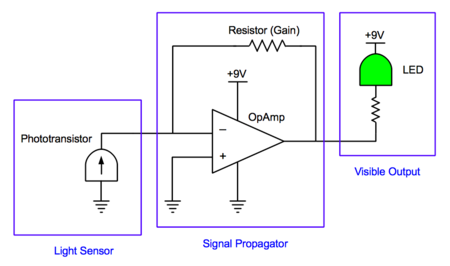 With the addition of the feedback resistor connecting the output to the minus input, the OpAmp translates an incoming current signal into an outgoing voltage signal. The OpAmp is analogous to the transcription/translation machinery that translates an OmpR signal into synthesis of LacZ in the living bacterial photography system. Resistor: component which resists current flow by producing a voltage drop across it. The voltage equals the current times the resistance of the resistor; thus, the resistance sets the "gain" or amplifier strength of the system. By varying the resistance, we can vary the circuit's sensitivity to light. The resistor is analogous to the strength of the promoters and ribosome binding sites in the biological system, which raise or lower the efficiency of LacZ production in the living bacterial photography system. LED: a device with a detectable output (analogous to LacZ). A voltage drop across its terminals turns the green-colored light on. The small 820Ω resistor is placed in line with the LED to ensure that the current through the LED isn't too high, which can fry the LED. This small resistor has no direct analogue in the bacterial photography system. The LED is analogous to LacZ in the living bacterial photography system. Take a look at the rows of holes on your breadboard. In the middle, the holes are arranged in short rows of five. The five holes in each row are all connected to each other (via thin strips of metal inside the breadboard). On the sides are the rails, or long rows of holes marked with red or blue lines and a plus or minus sign. All the holes in a rail are connected to each other. Rails allow you to conveniently serve power/ground to many locations at once. The purple wire and the orange wire are connected. The orange wire bridges the two separate halves of the breadboard. The purple wire and the green wire are not connected. Power is delivered to the red rail at the top of the breadboard via the red binding post, which connects to the battery holder. The short yellow wire, the purple wire, and the orange wire are all connected to power. Ground is delivered to the blue rail at the bottom of the breadboard via the black binding post, which connects to the battery holder. The green wire is connected to ground. Our basic "Hello, World!" circuit. 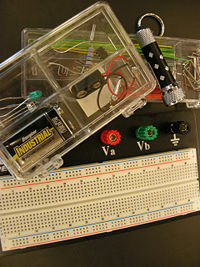 Deliver power from the battery to the rails on either side of the breadboard. Use the binding posts to connect the battery leads to wires, and plug the wires into the rails. Unscrew the plastic part of the binding post, insert a lead and a wire into the hole, and tighten the plastic part. To get a good connection, make sure you are clamping down on a metal wire and not on the plastic insulation around each wire. Now plug in the LED and the resistor. Push in the wires firmly to make a good connection. You should see light. If not, check your connections, make sure your battery is not dead, etc. 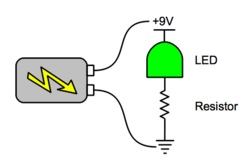 The resistor is needed to limit the current through the LED. Too much current can damage it. The LEDs in this kit are strong enough that they won't burn out instantly if you connect them straight across the battery, but using a resistor is still recommended. You could also put the resistor on the power side and the LED on the ground side; it makes no difference. 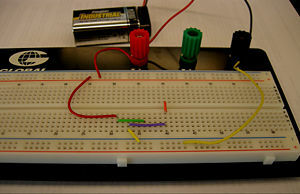 Position the OpAmp across the trench in the breadboard. Note the small dot or half-circle marking pin 1 or the "top" of the OpAmp, as shown in the connection diagram. Power the OpAmp by connecting its voltage source inputs to the power rails (pin 7 to +9V, pin 4 to ground). Connect the OpAmp's plus input (pin 3) to ground. Connect the OpAmp's minus input (pin 2) to the photodiode. Remember, the photodiode is polarized. It must be connected so that the leg under the flat side is to ground. You'll make 2 connections to the OpAmp's output (pin 6). First, connect it to the LED and the small, 820 ohm resistor. Remember, the LED is polarized. It must be connected so that the leg under the flat side is to the resistor and the other leg is to power. Next, connect the OpAmp's output (pin 6) to the large, 10 mega-ohm resistor. Connect the other end of the resistor to the OpAmp's minus input (pin 2). You will change the gain of the amplifier by varying the resistance at this point (using the large resistor, a wire for zero resistance, and no wire for infinite resistance). Double check your connections with the circuit diagram above before you power it up. 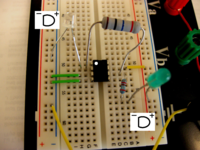 Test your circuit by shining a light on the photodiode and seeing if the LED responds. Explain the role each component plays in the electronic circuit. Which part of the biological circuit does each represent? No doubt, building this circuit was quicker and easier than actually assembling a biological circuit -- for example, you didn't have to wait for bacteria to grow, or spend time cutting and pasting wires the way you would cut and paste DNA to make a functional plasmid. What are some traits of these components, of the breadboard, or of electronics in general, that make electrical engineering easy in this way? Every analogy has limitations. What are the limitations of the circuit you built as a model of the bacterial photography system? What could you do to make it more realistic? If your teacher specifies, continue to this exercise for exploring gain. You may be asked to answer the questions associated with each section. A circuit with very tight fully-on-or-fully-off behavior is more "digital", or switch-like, while a circuit where the LED can have a wide middle range of brightness is more "analog", or dial-like. The range of flashlight intensities that can hold the LED half-lit is a measure of the gain or strength of the amplifier. More precisely, the gain is the slope of the LED-output-vs.-photodiode-input line. Because the maximum brightness is the same for every circuit, a high-gain amplifier will cause the LED's brightness to max out even at a low level of input to the photodiode, whereas a low-gain amplifier will cause the LED's brightness to increase slowly before maxing out, as the photodiode input increases. We can tune this gain by changing the value of the gain resistor. Right now, the OpAmp's output and minus input are connected with a 10 MΩ resistor. What happens to the LED when you power up the circuit? What happens to the LED when you shine the flashlight on the photodiode? Can you get the LED to hold steady at 1/2 its maximal brightness, by moving the flashlight farther away, shading it, etc? Sketch a graph with flashlight intensity on the x-axis and LED light intensity on the y-axis. At infinite resistance in place, is the circuit's behavior better described as a switch or a dial? Replace the 10MΩ resistor with a wire. Can you get the LED to hold steady at 1/2 its maximal brightness? Add a line for this circuit to your graph. Is this circuit's behavior better described as a switch or a dial? Remove the wire connecting the OpAmp's output to its negative input. Add one last line to your graph. Is this circuit's behavior better described as a switch or a dial? How does this relate to the end of the computer simulation exercise, when you tuned the system with sliders? When might you want switch-like behavior in a biological system, and when might you want dial-like behavior? What are some everyday examples of switch-like and dial-like systems? What element or aspect plays the role of "gain" in each one? When you've finished your work on this part of the activity, upload your data to the link on the BioBuilder site that's here. You'll be able to compare what you've done to what other BioBuilders around the country have tried. This page was last edited on 18 January 2012, at 07:32.